It's the start of a new school year. Back to routine, back to structure...homework, pencils, alarm clocks...homework... I don't know about you, but I am excited for a new season and getting back to some routines. I thought a post about organization might be timely, no? 1) I've never been alone all day with a kid this age. By the time his older siblings were 3, there was always a new baby to distract and amuse us. (I've also never been alone with a kid who has just lost his two best friends to school, leaving me as his sole playmate). Um, what do I do with him all day every day?? I thought we'd start off by seeing if we could learn all the US Presidents in order. So far, no...but we are pretty good at laying down and taking selfies. 2) I'm a business owner. Even though that baby is a whopping six months old, of course it still feels brand new. And even though work has been wonderfully steady, I'm still figuring out the best times of day to, er, work! How do I carve out time for that when I'm doing whatever you do with a 3-year-old kid all day every day?? Anyway, the point is, I'm figuring out a whole new normal this school year. And in order to be intentional with my time, I'm finally starting to figure out how to actually. manage. time. A few months ago, on Instagram, I was moaning about how bad I was at getting things done in, ahem, a timely manner. Afterward, I got a message from a professional organizer named Beth who offered to help me with my time management issues. YES! Are you kidding me? Yes. Her tips were so immensely helpful that I asked if I could share them on the blog. (I didn't want to give away any trade secrets or anything). She said it was all fair game and feel free, (woohoo!) so I'm going to pass along the pearls of wisdom I took away from our sessions! First, Beth and I met for an initial phone consult where she got an understanding of the problems I was having. (She, by the way, is the founder of B'Neato Bar and one look at her website makes you want to download her brain). My "issues" are probably pretty typical: Balancing running a business with raising kids, finding time for bigger projects, making time for friends, keeping the house clean and keeping my sanity, etc. etc. Basically, my to-do list was longer than my day, every day, and finding a way to be successful at work without completely ignoring my family (or finding a way to be a present wife and mom without sacrificing my career, however you want to say it), was something I desperately needed to figure out. Beth then gave me a horrible assignment. She had me spend two weeks tracking my time. Yep, just like when you go on a diet and keep a food log, I had to write a time log. It was painstaking to do this exercise, but so eye-opening. Right out of the gate, I realized why I feel like I can't get anything done- I'm a mom! My time sheet was recorded in 2 minute increments as that was about all the time I got on Day 1 to dedicate to any task before being interrupted. It instantly made me realize I was being way too hard on myself and expecting to get done way more than I am physically capable of. So rule one: Give yourself grace! (And some coffee and some time in bed, even if you have to forcefully acquire a runny nose and hacking cough to get it)! You're doing way more than you think. I should also mention that Beth gave me an app to track the time I spend on my phone every day. We do NOT want to discuss those disturbing results. For anyone brave who wants to know, the app is called Moment. This may be second nature to most of you, but when I learned that other people always shower at the same time of the day, I was shocked. I've literally NEVER had a daily self-imposed routine. The first thing Beth said is that I needed one. So she had me walk through a typical Monday for her. From the time I wake to the time I hit the pillow again, everything I have to do - like shower, eat, feed my kids, do laundry, bedtime stories - was listed out. I then chose times that I would commit to doing those routine tasks each day. For instance, I chose to shower at 9:00, and always fold laundry from 3-4 on Mondays, and always serve dinner at 5:30. Those things would be plugged in on a weekly calendar and became my "routines." Now that we had done some self-evaluation to decide upon routines, we could map out my week. 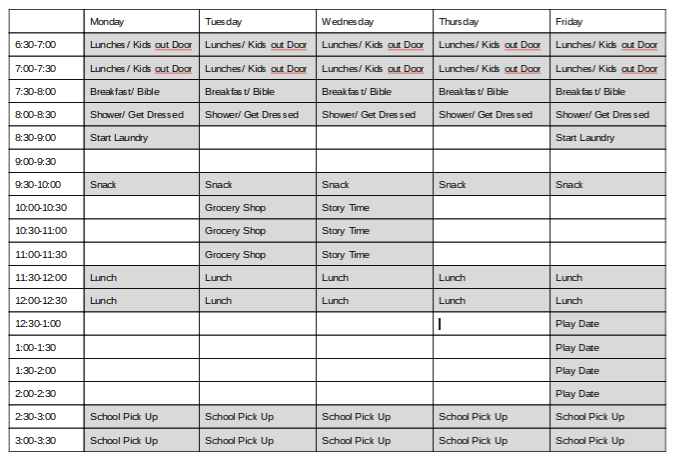 I used a table in Google docs to make a 5-day schedule showing time in half hour increments. The map should have all the routines written in, and I color blocked them so it was obvious they are not free time. Once this was done, I could see a complete and realistic picture of my week, showing all the blank slots of time I actually had. I was surprised to see how much time was open. I usually feel like I have NO TIME AT ALL, but after creating my map, I had at least 6 hours every day that I could use. I felt rich, in a weird way! I used to start every day by writing a long to-do list of all the things I wanted to get done. Even though I knew I wouldn't be able to get to them all, (though I secretly hoped I could), I needed a place to write them down where I could find them again. Eventually, I would copy the "undone" things to the next day-- every day-- and always feel like I was falling behind. I never had a day where I could cross off everything and tell myself "job well done." Beth kindly suggested that this was a very discouraging way to keep a to-do list. 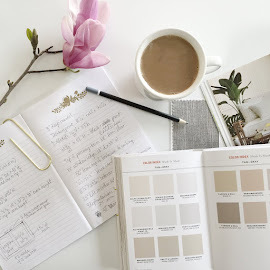 Rather than put it all in my daily planner, I needed a separate place to "brain dump" all the projects and ideas and wish list tasks that had been taking up space in my brain. The tool she gave me to use is Google Keep. 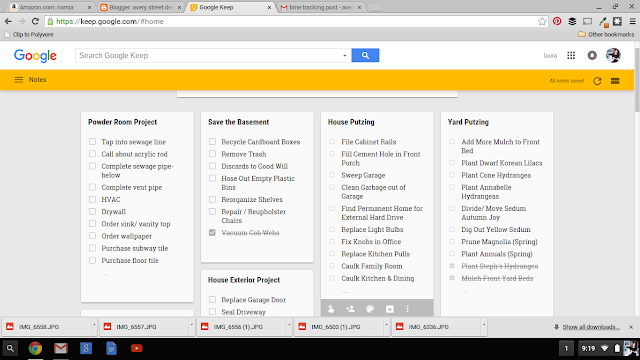 All of my to-do items that are not routine are to go in Google Keep and I have a running list of everything I want to get done. It is safe there, and out of my brain. Let everyone take note that I bravely vacuumed basement cobwebs this weekend. I can still feel them in my hair. Shudder. Now that my thoughts were safe with Google, and I had a map of the week, I could fill in the blanks in my schedule. Referring back to the Brain Dump list, Beth told me to pull tasks out of Google Keep, in order of personal priority, and plug them into my open time slots. I began to see that there is time to get things done. Not everything, but many things! I'll give you an example of how this changed my conception of time. At the start of one week I had two projects I wanted to tackle: 1) Cleaning out & organizing the boys' room, and 2) Mulching our flower beds (which would include buying mulch). It seemed pretty reasonable that I could accomplish these two projects in one week- after all, five whole days, right?! But after plugging in all of the routine stuff and the normal-taking-care-of-house-and-kids stuff, plus all the back-to-school stuff, the getting-in-one-last-vacation stuff, and the work stuff, I was able to SEE that there is noooooo way both of those projects were happening. This was so good to know. 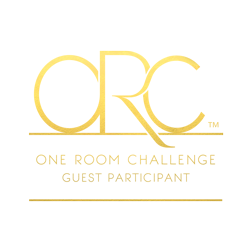 I had to choose which one was more important (boys' room, for sure, as it was causing my sanity to go out the window on a daily basis), and save the other for the following week. Above all, this whole exercise taught me how to be realistic. How to manage and account for my time in such a way that I made realistic expectations for realistic goals that I could realistically meet. I know much better now what I can say yes to, and what I should politely decline to take on. I realize more clearly that there aren't an infinite number of hours in a day and when I really need to start something in order to get it done on time. I realize that writing in time to "play" with my kids is a priority and an important thing to protect. However, having an organized and realistic view of time is only half the equation. The other half is sheer force of will. It's on me to actually DO the things I've written in those little slots. I'd like to thank Beth for giving me these insanely helpful tools for organizing time. If you are looking to spend an hour on the internet that will seriously motivate you to clean out your whole life, go stalk her on Pinterest, Instagram, and on her website. Good grief I nerd out over the navigation on her home page. I just hover over all those little boxes and say "Yes! I want that! That too! Leave the garage door open and NOT cringe when the neighbor drives by and looks in? What does that even feel like!?" Side note for anyone who is wondering, no, Beth didn't sponsor this post. She did give me this advice for free, but I think that was more of a kindhearted "take pity on this poor woman" decision than a business decision. ;) I'm really grateful she took the time, and I'm really grateful she let me share the process with you! Thanks again Beth! How about you? 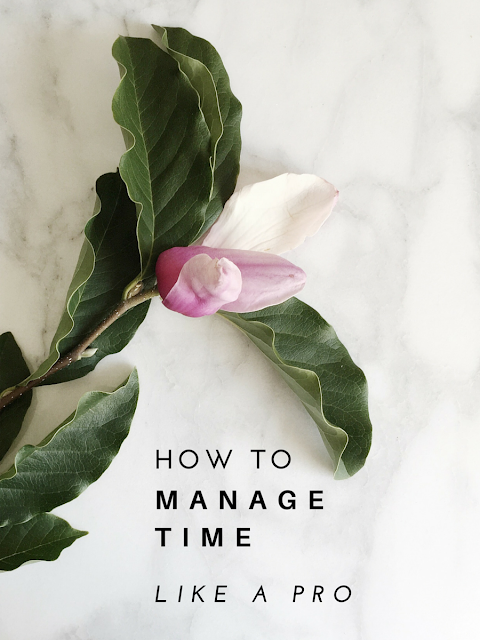 How do you manage your time (or not manage it, as the case may be?) 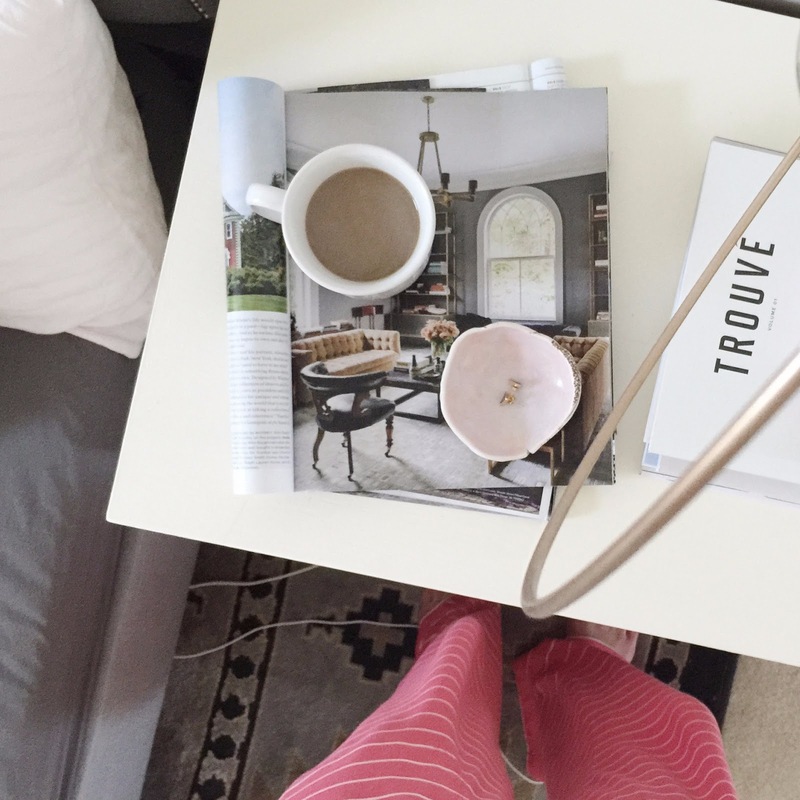 What have you found helps you to organize your day? I'd love to know! Sheesh, I thought I was organized until I read this! I am going to share this on my IG if that's ok. It's pure gold! Heading to Beth's website pronto! 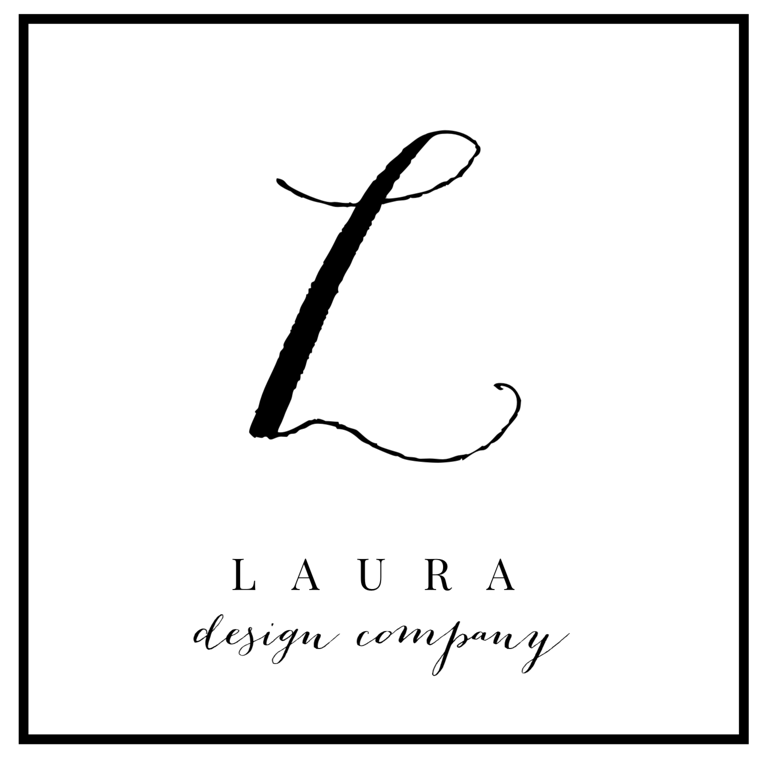 Thank you so much for sharing Laura; you laid it out beautifully and there are so many great takeaways that you have added. Love it!!!! Amazing! Thanks for sharing! Life can get so busy, it's great to see how your find clarity! Enjoy those kids, your job, and your "you" time!! !